Microsoft Office 2010 includes a wide variety of updates and new features over the previous release in the Office line of productivity software. Users are no longer restricted to use on a single computer with new share functions and mobile-friendly tools. Office 2010 takes your experience with this long-lived productivity suite to a new level pushing all boundaries. Advanced picture formatting tools and a wide range of customizable themes and SmartArt graphic layouts are just a few examples of what’s new. If you are trying to update or have updated to Office 2010, it is possible that you encountered problems during this process which could prevent you from using your new software.There are several software options to install, depending on which version of Office 2010 you have. This includes Word 2010, PowerPoint 2010, Excel among other more specific tools primarily targeted towards groups and businesses. OneNote 2010 is one of the available tools which allows you to share your important information between devices anywhere whether it’s from your home computer, your laptop or even your smartphone. 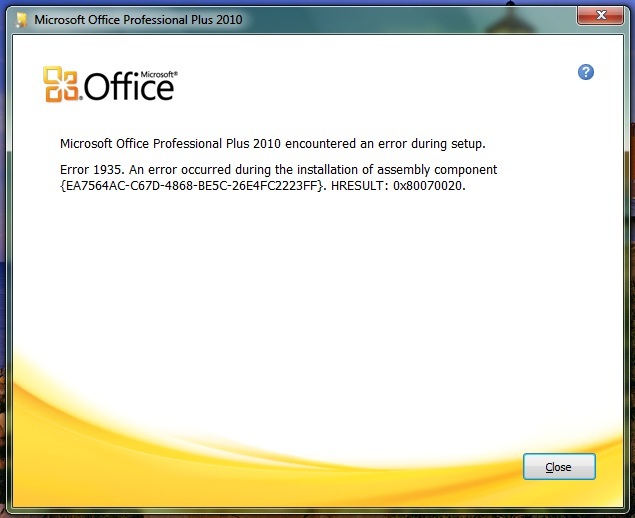 As usual however, software installation problems and vulnerabilities are also associated with Microsoft Office 2010. Issues not only make their way in the path of product installation, activation, update or upgrade but hinder the performance of the installed program as well. Most of the installation issues are related to operating system compatibility, and corresponding error messages indicate clearly as what to be done next. To be on safer side, you should read the system requirement first. If you don’t have the compatible OS then it’s recommended to get the one. Also, try to run the Office 2010 Setup in non -compatibility mode (you can do it through the properties window of setup file). At times, Microsoft Fix It tool may pop-out with two options: “Fix it for me” and “Let me fix it myself”. The tool will diagnose the system, and will fix the corresponding error or will give instructions, when it’s beyond coverage. Alternatively, search through the knowledgebase and Microsoft Answer community to find a fix for any prevailing installation issue. If you lack the technical expertise to fix these problems yourself, don’t worry. You can get in touch with Microsoft Support via phone, chat or email, and allow experts to guide you through the entire process or even analyze your system remotely. They can accurately troubleshoot the system accordingly. Don’t let installation problems with Microsoft Office 2010 get you down. If you follow these tips or contact Microsoft’s support department you’ll be on the path to a solution in no time so you can get back to being productive. After all, that’s the purpose of Office 2010, isn’t it?